What is an expected behavior when Windows runs out of memory? When my machine with Windows 8.1 runs out of memory (RAM), Windows displays a message telling that memory is low and that I invites me to terminate an offending application. If I agree, the termination means that I will lose any unsaved changes in the given application. If I ignore the message, a few seconds later I lose access to the machine: the screen turns black and there is nothing I can do aside holding power button for five seconds. In both cases, the handling of low memory situation by Windows seems too unprofessional. It's like if when I run out of disk space, Windows would ask me if I want to format the disk right now or on the next boot. Is it the expected behavior, or something is broken in my case, and normally, Windows handles low memory situation differently? If so, how? Windows does not have any such error message for running out of RAM. You're seeing this because you're running out of pagefile-backed virtual address space (i.e. "commit charge" is approaching the "commit limit"). 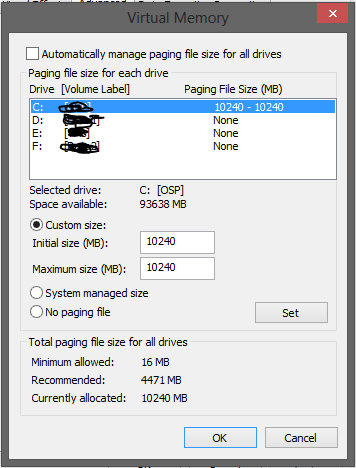 You can fix it by increasing the size of your pagefile - or by setting up a pagefile, if you've deleted it. Operating systems, and applications need access to memory. If you use it up Windows will ask you if it's okay to free some through program termination, but if you refuse all Windows can do is keep running till it runs out of memory. If you don't want the system to crash you'll need to close applications. This is not a Windows thing, it's an EVERY operating system thing. If you computer doesn't have much ram, an upgrade could help. If your pagefile is currently small, increasing the size may help. To check/alter size go to your Control Panel/System And Security/System/Advanced System Settings then under the Performance area choose "Settings", click on the "Advanced" tab, and in the "Virtual Memory" area click "Change". You will then be able to see, and alter the pagefile sizes. Typically 1.5x the amount of ram you have is a good amount (some people say 0.5x), and if possible make the initial size and max size the same so the space is pre-allocated (this improves performance). If you change the pagefile size a reboot is needed for it to take effect. Not the answer you're looking for? Browse other questions tagged memory windows-8.1 memory-management or ask your own question. Less memory usage when running similar software?